The restaurant business is famously hard, particularly in London where rents and competition have become such juggernauts. Hackney’s low rents used to allow young or inexperienced entrepreneurs some room for error and experimentation, which is why some much loved local businesses such as the E5 Bakehouse, Passing Clouds or the now defunct Railroad Cafe seemed to be borne less out of a solid business plan than a narrow and determined vision to deliver something unique. It’s easy to wax nostalgic about the past, however, and Hackney’s food scene is undoubtedly superior now. 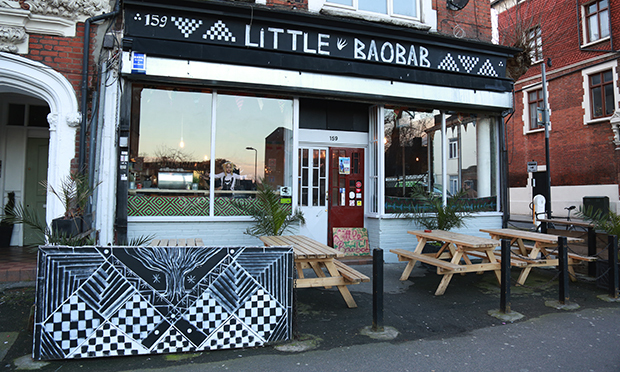 Some new arrivals are welcome additions, and one such place is Little Baobab, a new Senegalese restaurant and music venue that has opened up in the premises on Lower Clapton Road where Candela used to operate, before it disappeared without a sound. Little Baobab feels like the sort of venture that was popping up every day in Hackney a few years ago. Run by chef Khadim and musician Abdoulaye Sam, two friends originally from Dakar, Senegal, the restaurant hosts live music every night. When we went on Friday evening, the room was packed and people sat elbow to elbow around candlelit tables as a man played West African guitar music in the corner, propped up against the window. As the evening wore on the guitarist was joined by another musician and together they picked up the tempo. Staff were relaxed and warm, and were chatting casually to the mixture of customers, friends and family who were in the venue. The menu was scant: it had three mains to choose from and only one starter, as well as two juices. We opted for the African mains: I had curried lamb with peanut butter and rice, and my friend had a spicy spinach stew, both of them hearty and satisfying and coming in at under a tenner each. I had a rum cocktail with baobab juice, followed by some bog standard but very reasonably priced house wine that was £3.50 a glass. Beers on offer were an eclectic mix and mostly still being chilled when we arrived, which I took to be a sign of the restaurant cutting its teeth in its first weeks. Ultimately, however, the food was a backdrop to the convivial atmosphere. Let’s hope it lasts longer than its predecessor.